It may take a little while for all the pictures to download but please be patient, they are worth it. 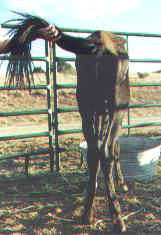 Slaughter: American Horses are not as protected as we would like to believe... At the last local horse sale in Los Lunas, 900 unbranded wild horses went to the killers. If they are not on BLM land, they are not protected. It is legal for ranchers to pay land owners a small fee per head to round up the wild horses, then run them through the killer auction. 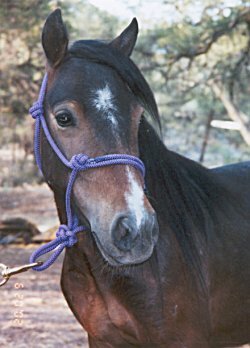 And please be aware, that, yes, the BLM does some things to make sure the wild horses in their care go to good homes, but it isn't enough... an adopter only had to have title to a horse for one year, and then said owner can do anything they want to with that horse, including take it to the killer sale. This is unacceptable. We as a country DO NOT have horse meat on our menus, so why to we allow our horses to go to slaughter to be shipped to other countries to end up on someone's dinner plate? 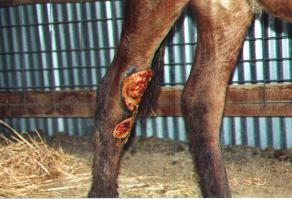 The quest for the "all mighty dollar" has caused unacceptable suffering and cruelty to our horses. 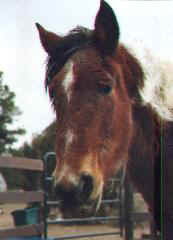 Jabez was found at a local horse trader's. He was only a baby, and he had been tossed in with a herd of larger, older, hungrier horses. Jabez was run through a barbed wire fence. 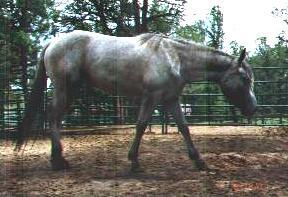 As he lost condition, he was simply ignored by the owner of the sale yard. We finally came along and asked about taking him home. The owner said he was suppose to go the killer sale, but if we "girls" wanted to "mess" with him, that would be fine, we could just come pick him up. 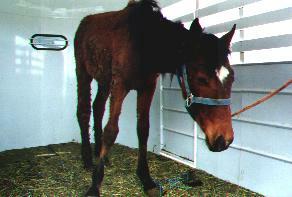 The "wranglers" forced him into the trailer and in route, I called the Vet, who meet us right away at Jabez's new home. Jabez was in absolutely horrid condition. 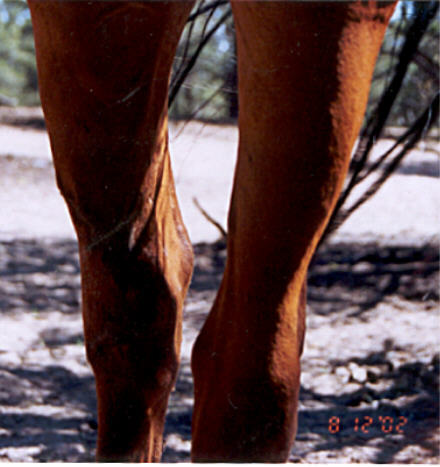 He was severely underweight, dehydrated, and his barbed wire injury on his hind leg, had been there so long, he hardly had use of it at all and the infection and proud flesh were incredible. The Vet tranquilized him and we cleaned up the wound, found it had rotten all the way to the bone, treated him for infection and parasites, both internal and external, Jabez was covered from head to toe in lice, he had serum scald wherever his leg drained and fungal infections under all the matted hair. 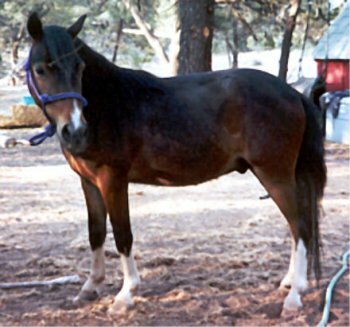 Jabez is of the Spanish Barb type. He has a straight face, short back, deep chest, sturdy legs and body. 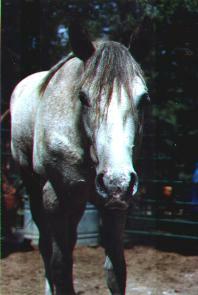 He is Silver Bay with a huge white star and snip. He is very intelligent and eager to learn and be friends. He hasn't much training at all due to his long recovery. We have simply been focusing on him getting well and being happy and able to use his leg. Jabez has just recently been gelded. 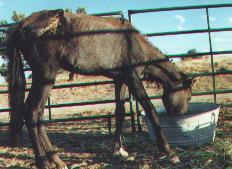 Maybel was found on the side of the road next to her mother who had been caught in a cattle guard. Maybel had previously been hit by a car and was very thin. She had a broken pelvis and was having trouble breathing. 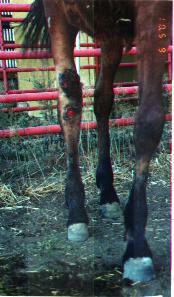 She was standing next to her mother who had broken both front legs in the cattle guard and was bleeding to death. Several Police Officers and a Livestock Inspector were standing around arguing about who's job it really was to shoot the mare. The Livestock inspector finally did. 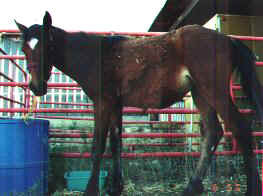 This mare undoubtedly suffered tremendously. The filly was brought to me to care for and try to save. She was covered in blood, her mother's, and was very thin and week. We tried for several days to save her life, but she had a tracheal injury that finally killed her. She and her mother were running loose on the highway due to "free range" laws in place in New Mexico and on the Reservation. Maybel was around 8 months old. She had no body fat, was wormy, had a fractured pelvis, a bullet wound in her shoulder and tracheal injury. She had a big "spark" in her eye and tremendous will to live. After a week of incredible effort by everyone involved, but especially Maybel, she died. Maybel will always be remembered, not only because of the shape she was in, but because of her awesome spirit. During the time Maybel and her mother were on that road, hundreds of people drove by without paying any attention. 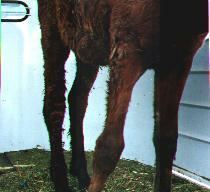 How long did it take these horses to get into this condition in the first place? How many people ignored them then? They didn't get this way overnight! Sadly there are horses wandering around like that all the time, and people just pretend they don't exist. 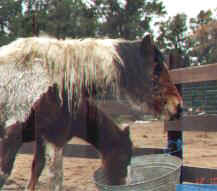 In the law's eyes, if no owner comes forward, no one is held responsible for horses in this condition, yet if someone like me tries to help them, that is illegal in this state. It is still on the books as horse thieving. Even if there is no owner and the horse is in such bad shape that if there was an owner, they wouldn't deserve to get the horse back anyway! Yet, people like myself and everyone that helped with Maybel, simply cannot and will not look the other way. We have to rescue and rehab very quietly. Now, we work directly with the local Vet and that makes legalities much easier. The Vet has control over medical issues involving care and placement and that allows us time to wade through the red tape and allows us to care for the horse in spite of the red tape. 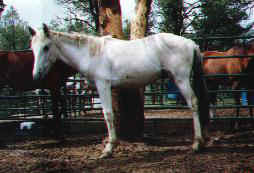 Flurry was brought to a sale lot off the Navajo Reservation. He was caught out of the wild along with two other colts. The people that lived in the area needed money so they rounded up what they could from the wild herd and brought them in. The owner of the sale lot gave $75.00 each. The other two colts sold right away. I purchased Flurry. Flurry was thin and wormy. 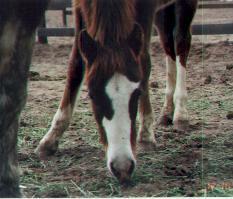 This happened to be during the Spring, so the horses had just gotten through a tough winter. All he needed was to be dewormed, fed and loved. Flurry's first experience with humans wasn't a good one. He was pulled from his home environment, loaded into a horse trailer, unloaded, left to fend for himself, and then when I came along, he was loaded again, driven to a new place, unloaded into a pen... and then the good care started. Flurry was very frightened at first, but, he came around amazingly fast. Within days, he was coming up to us, letting us scratch his face, then his neck, before we knew it, we were able to halter him for the first time in his life, brush him all over, and lead. Flurry has been with us ever since, and about a month ago, we had to load him in another trailer, because we were moving to a new location, we asked him to load, in hand, and within minutes, he was in the trailer, happy as could be. No stress whatsoever. He unloaded just as easily. The intelligence these little wild horses have is incredible... they never cease to amaze me. You ask them to do something, they think it over, once they understand, they do it, and you never have to teach it again. Flurry did get frightened while he was in the trailer, the guy that was helping to move him, got into the trailer with him, of course, Flurry felt caged in and did what his instincts told him to do, and turned and kicked the fire out of Kory! I have never seen a horse kick and reload, and kick again, so quickly! His name fits him... Flurry. The next day, Kory was working in Flurry's new pen, Flurry came right up to him, put his face up against Kory's arm as if to apologize, they have been friends ever since. When we first got Flurry and he was still afraid, he got himself wedged under a pipe panel, he had the common sense to lay still and wait for help. He never fought, thrashed around, nothing, he just kept still and waited. When I found him, I had to push on the top of his head to get it out from under the panel so he could get himself into the right position, he was accepting all of this, and when he was sure he could get up, he did. No injuries, no stress. As any horse owner knows, this is a very valuable, rare trait! 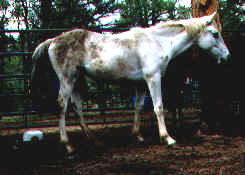 Flurry is all white, with gray mottled skin. 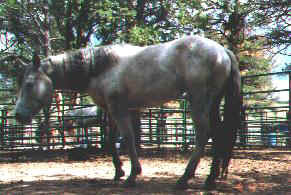 He has black in his mane and tail and tiny gray spots on his rump. He has some browning around his pasterns. He is a very handsome fellow, although keeping a young boy in a white coat clean, is impossible! Flurry is all boy! Mess and all! He is of the Spanish Barb type, and I will be sending samples off to a lab for DNA analysis to see what kind of "markers" he carries. Flurry was just given AA status with the American Indian Horse Registry! He was recently gelded! Throughout the Winter, Sophie grew and grew... boy was she a mess! A face only a mother could love! She just warmed my heart every time a saw her! She very quickly became friendly and very social. 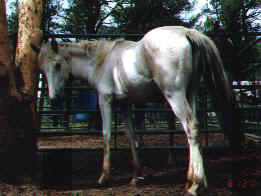 She is also one of the smartest horses I have ever known. Her wild instincts are very sharp, she thinks things through. The does not just simply react to things... she has to think them over, and once she understands, she is totally willing to do whatever you ask. Sophie has a few very tiny spots. White sclaras in both eyes. Mottled skin. She is gray with black points. 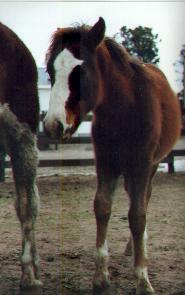 A large white blaze on her face. Her mane and tail are also very thick and curly. Sophie stands out from all the other horses... something about her is very different. She is not like domestic horses. Her body style is very different as well. She does not, by any means look modern. Her intelligence stands out as well. One time she got herself caught under a pipe rail fence, instead of struggling, like I have seen domestics do, she just laid there waiting. When we got to her, she was very calm and allowed us to help her without any fuss. When she got up, she was a little stiff, but otherwise unhurt. When it came time to trim her feet, she did very well and accepted everything that was going on within minutes of being asked. We also moved all the horses to a new location, when we tried to load her to go to the sale, she would not load for anything! When it came time to load her to move her to the new location, she loaded right up without a single hassle. Sophie has a very easy going, lighthearted personality. She is always happy, willing, and eager to please. She will begin training under saddle this season and I will see how she likes Dressage. Sophie was just given AA status by the American Indian Horse Registry! 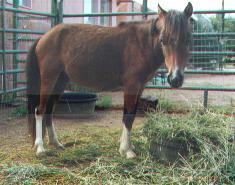 Jasmine and Magpie were rescued from the Los Lunas Horse Sale. They were headed for slaughter. 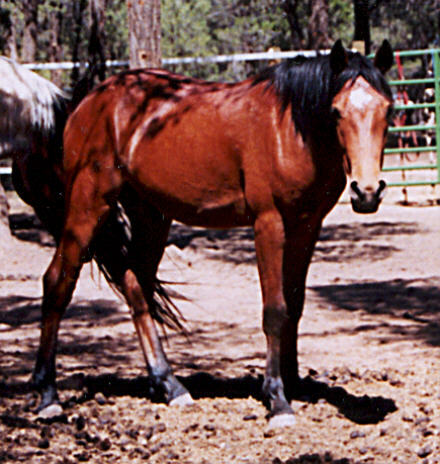 Magpie is a wild mustang, she was rounded up (we heard cowboys bragging about this) via helicopter and vehicles...her entire heard was rounded up, stuffed into very small pens, overcrowded, over stressed, exhausted, hungry and terrified. 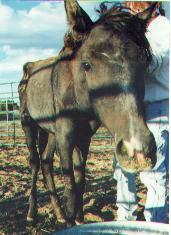 Magpie is only about 4 months old, during the auction she got separated from her mother. She lost her mother, was weaned and lost her entire herd and way of life in one single day. We couldn't tell who her mother was, if we could have, we would have bid on her too... we could see all of the mustangs the "killer buyers" had bid on, stuffed into holding pens, awaiting the double decker trucks. We later learned that 900 mustangs went to slaughter that day. 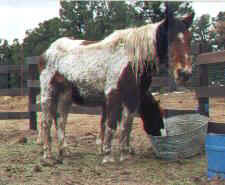 Jasmine is a very old mare... We believe her to be at least 20. She is tame and domestic. Jasmine most likely spent her entire life serving humans only to be thrown away. She got old, she got injured... who knows... Someone just decided for what ever reason, that they didn't want her anymore. Jasmine was in horrible condition... she needed to gain 200 pounds just to be thin! She also had a huge abscess on the side of her face. I am not sure what it was from... or how old the injury was, but it was painful and infected. We were told that she wouldn't make the 2.5 hour trip home... why take the chance? Because the least we could give her was a chance, and if she couldn't recover, a dignified, peaceful euthanasia. She didn't deserve to end her life at the killers. Both Mother and Baby are happy now. Magpie is getting more and more social as the days go by, she even whinnies at us if it is taking us too long to get there with the hay. Jasmine is much more active and always happy and interested in what's going on. Magpie and Jasmine have both recently been adopted by Hank Grizzle. Stewart was rescued from a pony ring... he was VERY thin and malnourished, had numerous skin problems, and was VERY standoffish... Not so any longer! This little guy has blossomed into the MOST friendly pony I have EVER known! He wants to be involved in EVERY thing ALL the time! He has also taken on the job of being the Mini horses "personal trainer"... He keeps everybody very busy and well exercised... and he takes his "job" very seriously! It is very sad that this little guy's personality was stifled for his first 3 years... When we first picked him up, he just didn't want too much to do with anything, or anybody. He even paced circles in his stall, I guess that is just how stressed he was... he left big rings in the dirt in his stall... He started to warm up as he felt better and got some food in his belly. It also helped a lot to get the skin issues under control. His skin was very dry, itchy, scabby and just plain yucky feeling. That has improved a lot with regular grooming and a good diet and all the fun he has playing with the other horses. Lots of people may think that pony riding rings are all fun and games, but that isn't always true for the horses. I know there are reputable people that run good businesses and take good care of their ponies, but that just isn't true for all of them. Many of the ponies are started under saddle way too young, work all day with their head tied to a post, and walk in endless circles all day. 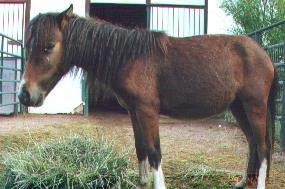 Some of the ponies are sick, injured, too old and even sometimes ready to give birth! And they still get worked VERY hard. Lots of times it is on hard concrete in hot parking lots, with very few, if any breaks. Ponies like Stewart, should be happy and be enjoyed by people and ponies should enjoy being around people... it should be a mutual thing... not exploitation (sp)... Stewart is an absolute JOY to be around! And that is how it should be! We have recently hooked Stewart up to a cart and lo and behold he drives. We are offering him for sale for $850 to a good home only.